Good news everyone! The new Futuramaland app is up and running! Now you can read Futurama Comics whenever or wherever you want on your handheld devices! Just download the free Futuramaland app from the iTunes store or Google Play! 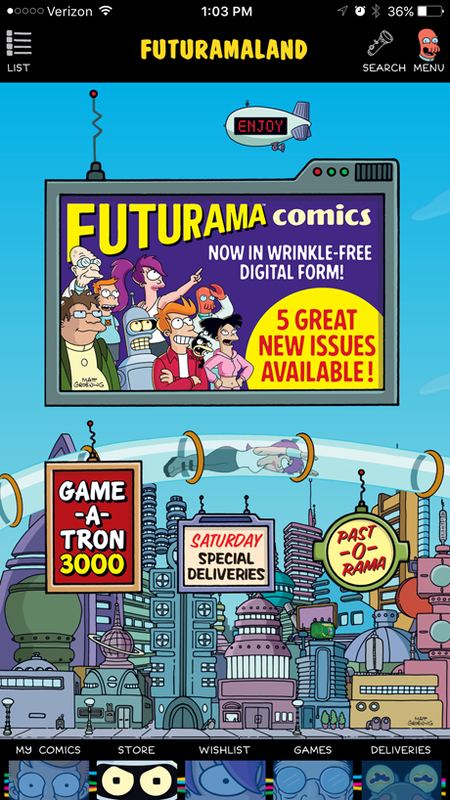 Once you have the app on your device you can purchase digital versions of Futurama Comics, play free Futurama games in “Game-A-Tron 3000,” get exclusive Futurama images in “Saturday Deliveries,” and more! New comics are available every Wednesday! And while you’re at Google Play or the iTunes Store, don’t forget to look for the ever-popular Simpsons Store App where you can get hundreds of Simpsons comics for your iOS and Android devices! Imagine the convenience of having a digital stack of Bongo comics to take with you wherever you go! Fill in your collection instantly with digital versions of those hard-to-find printed issues! What are you waiting for? Broaden your Bongo reading pleasure with both of these fantastic digital comics apps!